This is Logan. 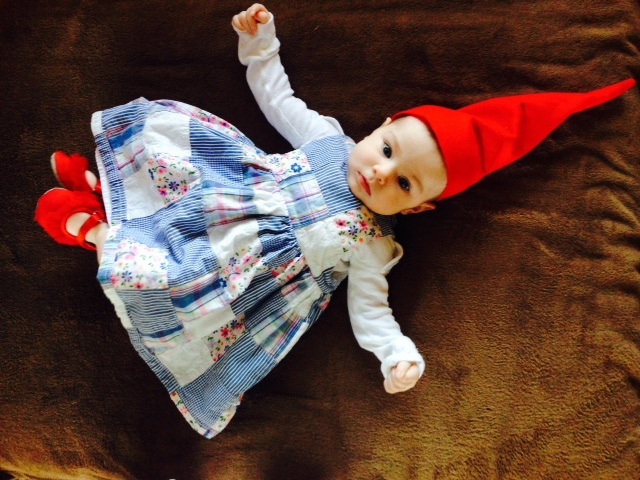 She was a gnome for halloween and this party was for her. 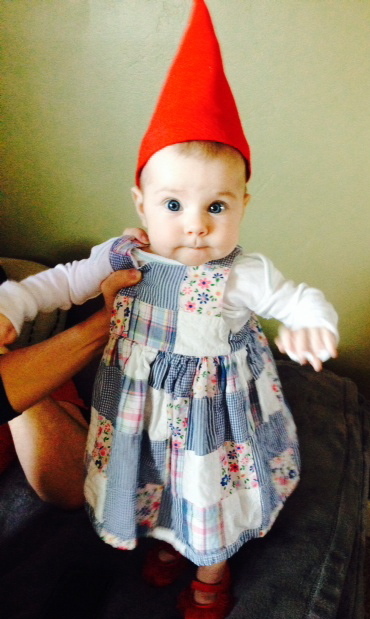 Many goodies were baked and many of her baby friends showed up. Oh, and there was punch! 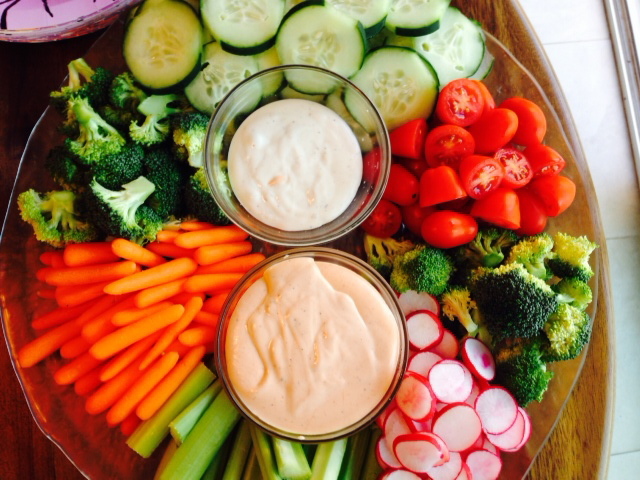 Choose your favorite veggies for dipping. I chose broccoli, radishes, carrots, celery, cherry tomatoes, and cucumbers. For the dip, you can do anything. I went with your standard ranch dressing and a homemade srirancha (ranch + sriracha). Go for hummus or an italian dressing for something a little on the lighter side. Cut up the veggies in slices and sticks and arrange on the plate however you want. It’s that easy. Next up is the Muddy Buddy mix. 1. Pour the box of chex cereal in a big bowl. In a small microwaveable bowl, mix the butter, peanut butter, and meltable chocolate and heat for 30 seconds. While that is in the microwave, get a large ziploc bag ready with the powdered sugar. 2. Stir the chocolate really well and pour the sauce over the chex cereal. Using a big spoon, coat it as evenly as possible. Immediately after it’s coated, toss the chocolate covered chex in the ziploc bag with the powdered sugar and shake until the chex are white. 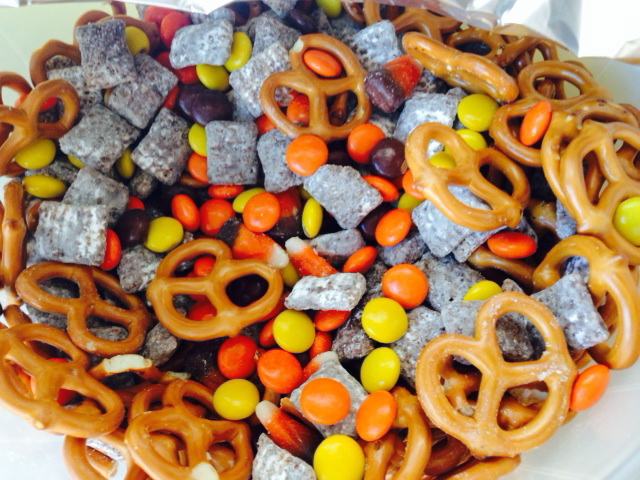 If you are using regular chocolate morsels, lay coated chex mix on parchment paper to harden. If you are using meltable chocolate, it should harden right away. 3. This is where you might need two bowls. Split the chex into both bowls evenly and add in bowl both the pretzels, candy corn, and Reeses Pieces so you have a ratio you desire. Have one bowl out for the party with small plastic serving cups next to it, and save the other bowl for yourself or family. If you are nice enough, you can give some out in little goodie bags to your guests. After that, we made the monster cookies. 1. Preheat oven to 350 degrees. Beat butter, cream cheese, egg, and vanilla until doughy. Add the cake mix into the mixture and beat until you can use your hands to knead. Once it forms a cookie dough, split into bowls to add food coloring to make the perfect colors (however many bowls for however many colors you choose). 2. Form cookie balls and coat in powdered sugar. Place on a cookie sheet 2 inches apart. Push your finger slightly on each ball to flatten it only a little bit before putting it in the oven. 3. Bake for 10-12 minutes. 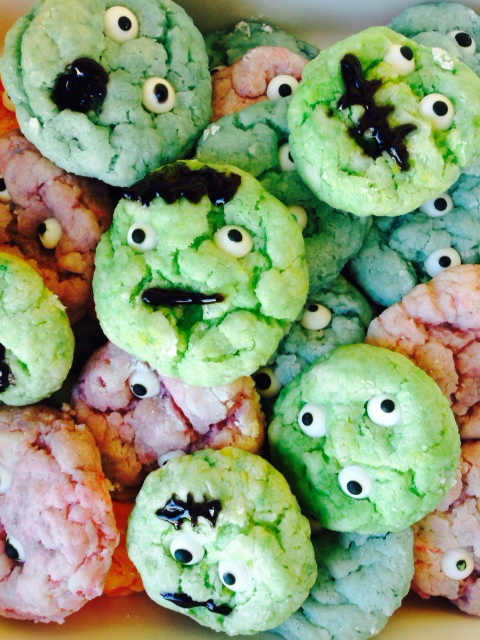 As soon as you take them out of the oven, add the candy eyeballs, however many are spooky enough. Let cool for 5 minutes. 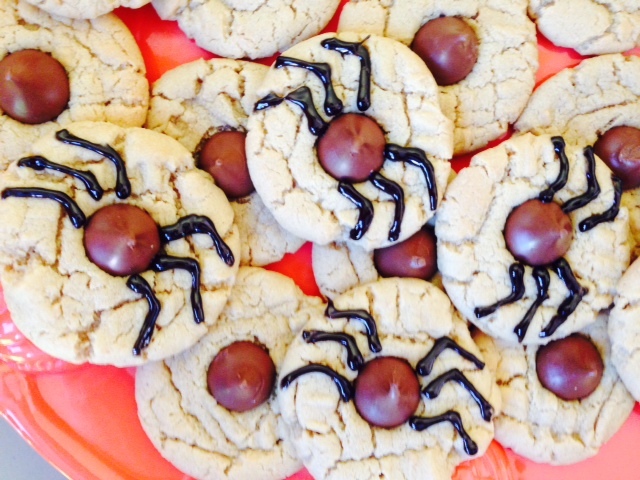 Peanut butter cookies are favorite of everyone’s, so we had to include those, and add some creepy spider legs. 1. Preheat oven to 375 degrees. Follow directions on the box to make the dough. When placed on the cookie sheet, crosshatch with a fork to press down the cookie ball. Bake for 6-8 minutes. 2. As soon as they are taken out of the oven, place a hershey kiss in the middle of each cookie. When cooled completely, draw on the spider legs. 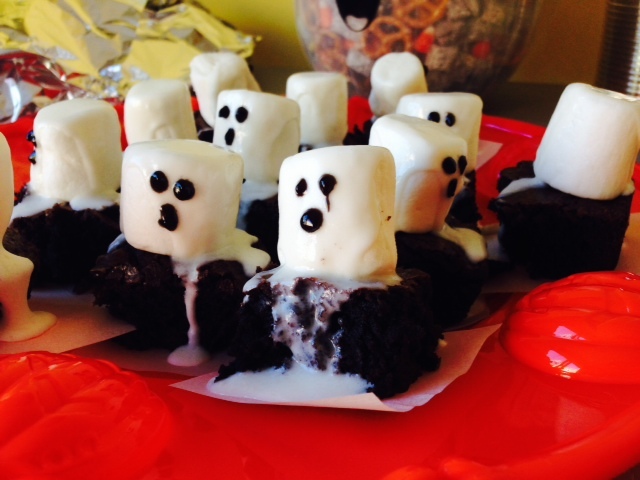 The last sweets I made were ghost brownies! 1. Preheat oven to 350 degrees. Make brownies as indicated on box (measurements may change depending on brand you buy). I used an 8×8 inch pan to make thicker brownies for the ghosts. Bake for 30-35 minutes, until a toothpick comes out clean. 2. Let cool for 1 hour. Cut into 16 small pieces (4×4). Cut small pieces of parchment paper and place each brownie on one. Place a marshmallow on top of each brownie. In a small microwavable bowl, scoop half of the icing and heat for 15 seconds at a time until it is in liquid form. Spoon icing over each marshmallow. Let cool and add eyes and mouth to each ghost. 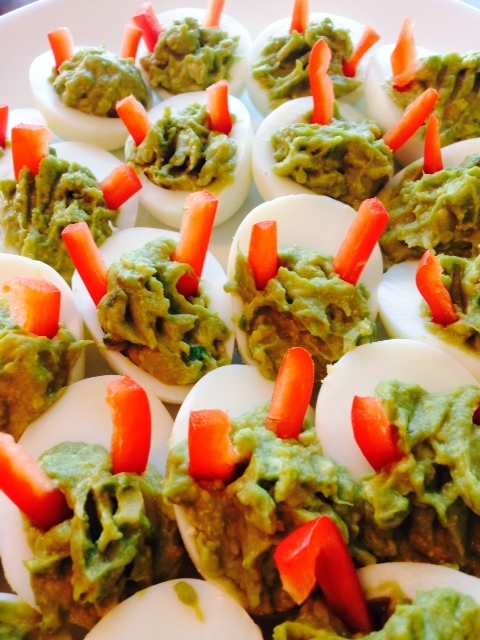 That was it for sweets, but I did manage to make some savory devil-ish deviled eggs. 1. In a big pot, place eggs in cold water and add either vinegar or salt to help any leakage of the eggs. Bring the water to a boil. Once boiling, turn the stove off and let the eggs sit for 15-20 minutes. Run the eggs under cold water to stop them from cooking until they are no longer hot. Peel each egg and place the eggs in the fridge. 2. In a medium sized bowl, add both avocados, lime juice from both limes, sriracha, and salt to taste and mix really well. It doesn’t need to be mixed perfectly, chunks are good. 3. Once the eggs are cool enough and when it gets closer to the party time, cut the eggs in half and discard the yolks, you won’t be needing them for this recipe. Spoon the avocado filling into each egg. Stick the red bell pepper horns into each egg. Refrigerate covered until people start to arrive. Tip: This recipe is best made right before people show up. You want to be careful because the avocado will start to brown. The lime juice helps keep it fresh, but won’t last more than a couple of hours. And there you have it! These were all of the goodies that I made at the halloween party. Everything was a hit and some of these items can be made the night before and stored in an air-tight container (monster cookies, muddy buddy mix, and peanut butter cookies). I hope this gives you inspiration for your halloween party or what you could bring if you were invited to one.